This two-part class is about how to put together an exhibition, from deciding what it will be about and why, to gathering, creating and arranging all the elements for visitors. You’ll learn a lot from your classmates – from their own experiences and from the resources that they share with all of us. And you’ll learn the best way: by doing – you will develop an actual exhibit over the course of the class. Both parts of this course must be taken in order to receive a certificate of completion and fulfill the requirements of the Small Museum Pro! series. OPEN REGISTRATION: August 13 – October 22, 2018. Please note that your registration is for BOTH PART 1 & PART 2 of this course. Registration limited to 25 people. CREDIT: Successful completion of this course will earn one credit toward the Small Museum Pro!certificate from AASLH. This class is about how to put together an exhibition, from deciding what it will be about and why, to gathering, creating and arranging all the elements for visitors. You’ll learn a lot from your classmates – from their own experiences and from the resources that they share with all of us. And you’ll learn the best way: by doing – you will develop an actual exhibit plan over the course of the class. Complete one or more exhibit-development assignments and share your work with the class. 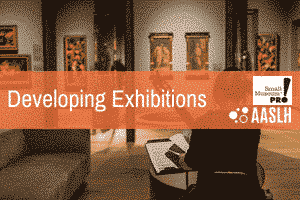 Have a network of small-museum professionals with whom to confer on future exhibits. Exhibit Makeovers, A Do-It-Yourself Workbook for Small Museums by Alice Parman, Ann Craig, Lyle Murphy, Liz White, and Lauren Willis (Second Edition, Rowman & Littlefield, 2017). The text is NOT INCLUDED with your registration. You must order the book separately from the book seller of your choice. This course is a beginning level course designed for professional staff and volunteers of historical organizations and libraries who have little to no experience with exhibit development and design. Alice Parman has spent a lifetime in museums. After earning a Ph.D. in Education (University of Chicago), Alice joined the education staff at Chicago’s Field Museum of Natural History. There she worked to help teachers use the museum’s resources more effectively, then chaired the Department of Education from 1973–1978 (as the Field’s first woman manager). From 1978–1982 she was director of the University of Oregon Museum of Natural History; from 1982–1988 she served as director of WISTEC (now The Science Factory), also in Eugene. In 1989, Alice joined Formations Inc., a Portland-based exhibit design/build firm with a national clientele. After 14 years as Senior Planner/Writer for Formations, she launched her own consulting business in September 2003. She is co-author, with Ann Craig, Lyle Murphy, Liz White, and Lauren Willis, of Exhibit Makeovers: A Do-It-Yourself Workbook for Small Museums, Second Edition (Rowman & Littlefield, 2017). Ann Craig (BA, History and Asian Studies, 2000, University of Oregon; MA, Arts Management, Museum Studies, 2006, University of Oregon) is the Director of Public Programs at The Museum of Natural and Cultural History at the University of Oregon. Ann has been with the museum since 2005, where she oversees educational programming and exhibitions for all audiences. She is a board member with the Oregon Museum Association, chair of the Museums of Springfield and Eugene (MUSE) and a member of the Lane County Cultural Coalition.